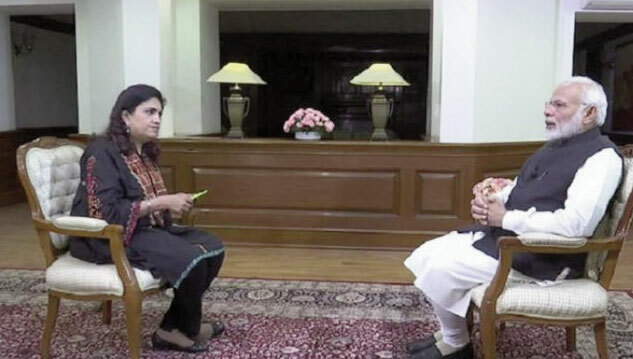 Prime Minister Narendra Modi in conversation with Smita Prakash, Editor, ANI. 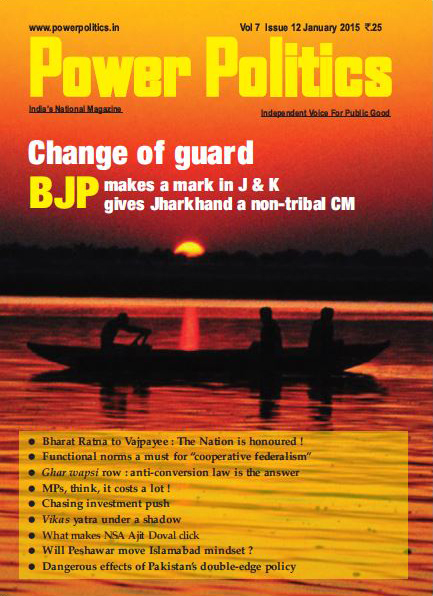 In the wake of the defeat of the Bharatiya Janata Party in the recent Assembly elections in the Hindi heartland of Chhattisgarh, Madhya Pradesh and Rajasthan, speculation is rife that the saffron brigade may face a similar fate in the upcoming Lok Sabha elections and lose power at the Centre. This speculation is based on the assumption that Prime Minister Narendra Modi , the saffron party’s supremo, who has been the star campaigner in almost all Assembly and Lok Sabha bye-elections in the recent years , has lost his charisma and he would not be able to get the kind of public support he almost single -handedly garnered in the last Lok S abha elec tions. Prime Minister Modi is, however, simply unfazed. In his long conversation with Smita Prak ash of the A N I, he talks of his vision, commitment and achievements during the last four and a half years of the countr y’s governance under his leadership and asserts his critics would be proved wrong. Smita Prakash : The year 2018 was not really good for the Bharatiya Janata Party. In the last five elections, it saw defeat. Are you confident of winning the upcoming Lok Sabha elections in 2019? Prime Minister: I would not think so. In my opinion the year 2018 was quite rewarding for us. Our Government has provided the poor insurance of up to Rs. 5 Lakh. Our Ayushman Bharat Yojna has benefited over 6-7 lakh people. In 2018, the UN awarded India the title of “the champion of earth,” a protector of environment. Until recently, 18,000 of our villages did not have electricity. We got every village electrified. In sports, Indian children have won a lot of medals. We have put 104 satellites in orbit. This is a record of sorts. India is breaking all previous records. SP : I am talking about electoral losses. The BJP lost in 5 states. Prime Minister: In Telangana and Mizoram, nobody even thought we would form government. In Chhattisgarh, the BJP lost. But in 2 states there was a hung assembly. We were fighting the 15 years of anti-incumbency factor . We are discussing what was lacking. SP : You have been talking about a Congress- mukt Bharat since 2013. Prime Minister: The Congress today represents the culture of casteism, dynastic politics, nepotism. When I say Congress-mukt Bharat , I mean to rid the country of this culture. SP : Some people say the BJP leadership needs to take responsibility for having lost the recent elections. Prime Minister: Those who think the BJP is running because of Modi and party president Amit Shah, they do not understand . The BJP is the largest party of the world. It functions with the spirit 'Mera booth, sabse mazboot.' Our worker is on this for 365 days.... The BJP moves forward with sabka sath, sabka vikas. SP : Is the morale of your party down? Prime Minister: There is no question of our morale going down. We are confident and are moving ahead. SP : Some of the reasons for your losses are said to be demonetisation, poor implementation of GST. Prime Minister: There used to be regular reports about black money. A parallel economy was running. Notes were found under beds. Sacks full of cash were found. Demonetization has done a big job . In the coming days we will set the country on the solid economic path. An atmosphere of honesty has been created. The tax net has expanded. SP: When will economic offenders be brought back? Nirav Modi, Choksi, Mallya are still enjoying outside the country. Prime Minister: Why did they need to flee, after all? Had there been governments like the previous ones, they would not have needed to flee. They had to flee because they would have to adhere to the laws here. They had to return every penny. Those who have fled, we will bring them back. For such fugitives, we have made stringent laws. Diplomatic channels, legal courses and seizure of properties through legal means are being implemented. I attended the first G20. The issue of black money was raised by me. We have entered into agreements with various countries. SP : Rahul Gandhi has called GST Gabbar Singh Tax, Grand Stupid Thought. Prime Minister: Jiski jaisi soch, waise uske shabd (The way someone thinks is the way someone talks). Have GST processes not been done taking a consensus with all political parties in the country? Since Pranab Mukherjee was Finance Minister, the GST process had been going on. In Parliament, unanimously it was passed. Before GST, what was tax rate in the country? 30- 40 % , hidden tax, repeated tax. GST has simplified all this. GST is a new system. It is technology driven. Some small traders have faced inconveniences. We do acknowledge this. Our government is sensitive to their concerns. SP : A loyal voter base for you has been the trader, working class, middle class. What will you do for the middle class? Prime Minister: For the middle class, we will have to change our thinking. The middle class never lives on someone's mercy. They live with dignity and make immense contribution to the country. It is our responsibility to think about the middle class, not only because they vote for us, but in the interest of the country. We have brought inflation down to 2-3%. It had once touched 18%. Its biggest benefit goes to the middle class. Prime Minister: They should not mislead the people. Solution is to empower the farmers. Why does farmer have debt? We should make a situation that he should not need loan. If the Swaminathan Commission report had been implemented in 2007, there would have been no need for loans. There is a very small segment of farmers who take loans from banks. A majority of them take loans from money lenders. Those farmers do not become beneficiaries of the waivers. SP : Why has the Ram Mandir been relegated to an emotive issue ? Prime Minister: Let the judicial process take its own course. After the judicial process is over, we are ready to make all efforts. SP: What about lynchings in the name of cows. The Congress and even eminent personalities like Naseeruddin Shah now say that Muslims are not safe in India. Imran Khan said he will teach PM Modi how minorities should be treated. Prime Minister: No such incident reflects well on a civilised society. This is totally wrong and condemnable. For improving this situation, we should all work collectively. A Muslim scholar, based in the Gulf, wrote that in India there is harmony in diversity whereas in his region people of the same faith attack each other. India should take pride in this. SP : What about political violence in the country? Prime Minister: I strongly condemn it. We have suffered a lot. In West Bengal, the BJP is not allowed even to exercise its democratic rights. In Kerala, our workers are killed day in and day out. In Karnataka, so many of our workers have been killed. Our workers have been killed in Tamil Nadu. In Assam, our workers have been killed. In Jammu and Kashmir, our workers are being killed. SP : The Triple Talaq Ordinance was considered a progressive move by you. On the Sabarimala issue, your party gets stuck to ageold customs and traditions. Prime Minister: These are two separate things. In the world, most of the Islamic countries have banned Triple Talaq. So it is not a matter of religion or faith. It is an issue of gender equality, matter of social justice. Everyone should get due rights. There are some temples, which have their own traditions, where men can't go. And men don't go... In this Sabrimala case a woman judge in the Supreme Court has made certain observations. It needs to be considered. SP: Will 2019 be ‘Anybody versus Modi’? Prime Minister: The public will decide the agenda. The public knows that earlier those who were in power in the states looted the states, those who were at the Centre looted the Centre. The people will decide whether they should ally with these forces of corruption who are coming together. It is going to be Janta versus Gathbandhan. SP: Why hasn't the BJP's grown in South India? Prime Minister: This is untrue. We are continuously striving to expand our base. BJP has MPs in JK, Tamil Nadu, North East. SP : The Congress and some political observers say the BJP government has weakened institutions in the country. Prime Minister: The Congress has no right to speak on this issue. In logon ke muh se shobha deta hai ? When the CBI’s internal personal matters came to light, they were both asked to go on leave legally. Institution is paramount for us. The RBI governor himself requested (to resign) because of personal reasons. SP : ED is called the Embarrassment Directorate. Vendetta raids are being conducted ? Prime Minister: How are these people saying this? ED is doing its job professionally. From a foreign country, a Razdaar has been brought in custody of India. SP : On the Rafale issue, Rahul Gandhi has made a personal allegation against you . Allegation is that Anil Ambani is your friend and that you helped put pressure on the French Government and Dassault to benefit your friend. Prime Minister: In Parliament, I have spoken on this . The matter has been cleared even by the Supreme Court. The Supreme Court scrutinised it threadbare. SP : On surgical strike, former Army officers have said there should not be any politicisation of surgical strikes. The BJP is using the surgical strikes to gain electoral benefit ? Prime Minister: I am myself of the opinion that there should be no politicisation of surgical strikes. After the surgical strike, no minister spoke about it... An Army officer apprised the nation of the operation. It is unfortunate that leaders of some parties raised doubts over the surgical strikes. It was necessary for Pakistan to speak like this to keep their morale intact. But what Pakistan was saying, was being said here too. SP : What were the objectives of this surgical strike? Terrorism has not abated. There is still cross border terrorism. Prime Minister: I don't consider it appropriate to talk about such things in the media. What strategy is to be adopted, how to do, is an ongoing exercise at appropriate levels. If after one war, we think Pakistan will behave, then this will be a mistake. Pakistan will take some time to behave. Ek ladai se Pakistan sudhar jayega, yeh sochne mein bahut badi galti hogi. Pakistan ko sudharne mein abhi aur samay lagega. SP: You invited Nawaz Sharif for your oathtaking ceremony, you went to Lahore, you sent a congratulatory message to Imran Khan before he took his oath...Some may ask why is PM Modi in a hurry ? Prime Minister: India, under whether the UPA or the NDA government, never opposed dialogue. It is our consistent policy to favour dialogue. We only say one thing that amid the noise of bombs and guns, the dialogue cannot be heard. Crossborder terrorism must end. And we are persistently maintaining pressure on this. We have created an environment around the world supporting this sentiment. Terror-supporting Pakistan stands isolated. Incidents have taken place, but in a limited manner. SP : Do you see any sincerity in Imran Khan's statements ? Will you head to the SAARC summit if invited by him ? Prime Minister: There is an old saying..."When we reach the bridge..."
SP : You have met Chinese President Xi Jinping 13-14 times. In response you got Doklam. Like Nehru, were you also deceived? Prime Minister: India should be judged on the basis of its response in Doklam. Nothing has happened with India that can be considered a deceit. Our principled position has been that we want friendly relations with neighbours. All Indian governments have maintained this. SP : There is a lot of criticism on your foreign trips. Prime Minister: All PMs have had more or less a similar travel schedule. There are a number of forums, summit level meetings. If the level is lower than PM, the voice is not heard. It is necessary to go for these visits. Manmohan Singh ji also had to do it. SP : The Ganga has not yet been cleaned up. Prime Minister: I have to take five states along on this mission. The money spent on the river since Rajiv Gandhi's time has not been used properly. A challenging task would be to cleanse the Ganga tributaries. SP : Any regret during your term as our Prime Minster so far ? Prime Minister: I leave it to people to decide whether they are satisfied or not with me. But one thing. I could neither make the Lutyen's world part of me nor myself part of it . My background is different. I am a representative of the non-elite world. There is honesty in my work. I work for the people.